Happy Holi Essay⇛ On the occasion of Holi, all the countrymen are very hearty congratulating. Holi is the festival of colors. Holi festival is celebrated in India and in other countries, it is celebrated with great enthusiasm. Holi festival is celebrated in India since ancient times. People gather in the coloring and cleaning of their homes about 15 days before preparing for Holi's festival. There are many such festivals celebrated in India which are celebrated in countries other than India as well as in the aforementioned countries. Holi festival is celebrated according to Indian ancient tradition in Pakistan, Bangladesh, Sri Lanka, and Maurice. Apart from this, the festival of Holi is celebrated with great fanfare in Spain, Nepal, Thailand, Africa, Italy, Belgium, America, Japan, and China. But Holi different days are celebrated in these countries. 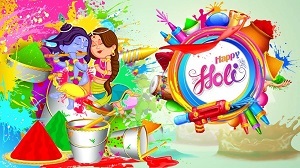 Holi Celebration⇛ The festival of Holi celebrated as 'festival of colors' is celebrated on the full moon day in Phalgun month. The color and water are thrown between each other between the sharp music and the drum. Like other festivals of India, Holi is also a symbol of good victory over evil. According to ancient mythology, the festival of Holi is associated with the story of Hiranyakashipu. Hiranyakashyap was a king of ancient India, which was like a monster. He wanted to take revenge for the death of his younger brother whom Lord Vishnu had killed. So he prayed for years to strengthen himself. After all, he got a boon. But from this, Hiranyakashyap began to understand himself as God and asked people to worship Him like God. This wicked king had a son named Prahlad and he was the supreme devotee of Lord Vishnu. Prahlad never considered his father's word and he kept worshiping Lord Vishnu. Angered by the son not to worship him, the king decided to kill his son. He told his sister Holika that she should take Prahlad in the lap and sit in the fire because the Holika could not burn in the fire. His plan was to burn Prahalad, but his plan could not succeed because Prahlad used to take the name of Lord Vishnu all the time and survived but Holika was burnt to ashes. This defeat of the Holika symbolizes the destruction of evil. After this Lord Vishnu slaughtered Hiranyakaship, so the festival of Holi is associated with the story of Holika's death. Because of this, Holi is burnt in some states of India as a symbol of the end of the evil one day before Holi. This story goes down to Lord Krishna's incarnation of Lord Vishnu. It is believed that Lord Krishna used to celebrate Holi with colors, so the festival of Holi became popular in color. They used to celebrate Holi with their colleagues in Vrindavan and Gokul. They used to play jokingly all the villagers in the village. Even today, the celebrated Holi like Vrindavan is not celebrated anywhere. Colour Festival Holi⇛Earlier the colors of Holi were made from flowers of tesu or Palash and they were called gulas. Those colors were very good for the skin because there was no chemical in them. But the definition of colors changed over time. In today's times, people use harsh chemicals in the name of the color. Many people have stopped playing Holi because of these bad colors. We should celebrate this old festival only in its true form. Holi is not a one-day festival. In many states, it is celebrated for three days. Day 1 - On the full moon day, the colors are decorated in a plate, and the largest member of the family spraying colors on the other members. Day 2 - It is also called Poono. On this day, Holika's images burn and Holi is burnt in the memory of Holika and Prahalad. For the blessing of the fire god, the mother spins five rounds of burning Holi with her children.